Golf Digest has selected five Nicklaus Design layouts among its prestigious roundup of “America’s 100 Greatest” golf courses. Muirfield Village Golf Club, the annual host of the Memorial Tournament presented by Nationwide, ranks highest on the biennial survey at No. 15. Sebonack Golf Club (Southampton, N.Y.) was ranked No. 38, Castle Pines Golf Club (Castle Rock, Colo.) was ranked No. 40, Whispering Pines Golf Club (Trinity, Texas) was ranked No. 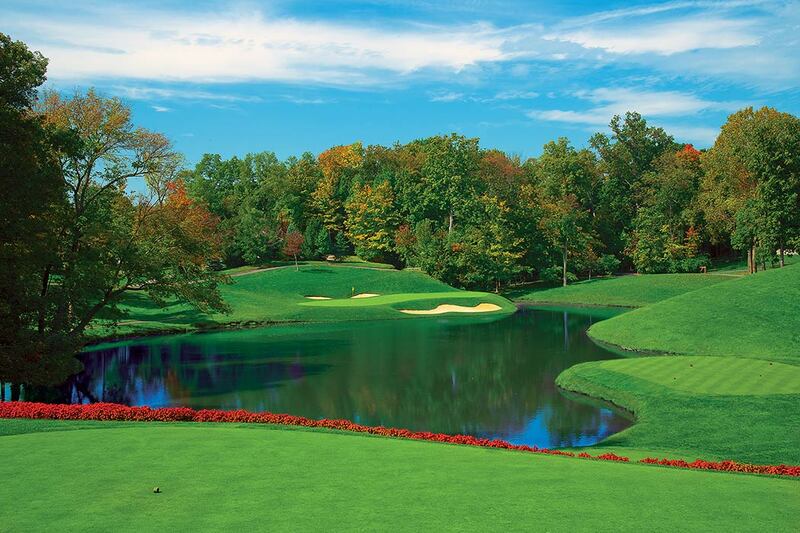 68, and Valhalla Golf Club, host of the 2014 PGA Championship in Louisville, Ky., was ranked No. 97. This year, Golf Digest named 12 Nicklaus Design golf courses to its Second 100 Greatest list. Those are: No. 101 Mayacama GC (Santa Rosa, Calif.); No. 102 Shoal Creek (Ala.); No. 106 Harbour Town Golf Links (Hilton Head Island, S.C.); No. 124 The Concession GC (Bradenton, Fla.); No. 138 Sycamore Hills GC (Fort Wayne, Ind. ); No. 143 Sherwood CC (Thousand Oaks, Calif.); No. 156 Pronghorn Club Nicklaus Course (Bend, Ore.); No. 158 Atlanta CC (Marietta, Ga.); No. 170 Spring Creek Ranch GC (Collierville, Tenn.); No. 175 May River GC at Palmetto Bluff (Bluffton, S.C.); No. 179 Desert Highlands GC (Scottsdale, Ariz.); and No. 183 The Club at Carlton Woods—Nicklaus Course (The Woodlands, Texas). The magazine included eight Nicklaus Design courses on its 2015-2016 list of the 100 Greatest Public Courses. Harbour Town Golf Links, Jack Nicklaus’ collaboration with Pete Dye and the first course the Golden Bear ever designed, led the Nicklaus Design courses named at No. 19. Others to make the list were: No. 28 Manele GC (Lanai City, Lanai, Hawaii); No. 33 Pronghorn Club—Nicklaus Course (Bend, Ore.); No. 70 The Bull at Pinehurst Farms (Sheboygan Falls, Wis.); No. 81 The Bear at Grand Traverse Resort & Spa (Acme, Mich.); No. 94 Old Works Golf Course (Anaconda, Mont. ); No. 95 Great Waters Course at Reynolds Plantation (Eatonton, Ga.); and Hualalai Golf Course (Kailua-Kona, Hawaii). The Best Courses in Each State included 84 Nicklaus Design courses in 32 states. Five of those took top honors in their respective states: Shoal Creek ranked No. 1 in Alabama; Castle Pines Golf Club ranked No. 1 in Colorado; Valhalla Golf Club ranked No. 1 in Kentucky; The Country Club of Louisiana ranked No. 1 in Louisiana; and Muirfield Village Golf Club ranked No. 1 in Ohio. The rest of the courses to rank in the Golf Digest’s 2015-2016 Best Courses in Each State are included below. Since the genesis of America’s 100 Greatest list in 1966, 22 Nicklaus Design courses have been selected. Harbour Town Golf Links, which opened in the fall of 1969, remained on the list for 42 consecutive years. Other courses to be included in the ranking have been Annandale GC (Madison, Miss., ranked for 4 years); Dallas Athletic Club Blue Course (Mesquite, Texas, ranked for 1 year); Desert Highlands GC (Scottsdale, Ariz., ranked for 10 years); Desert Mountain Club Cochise Course (Carefree, Ariz., ranked for 2 years); Desert Mountain Club Renegade Course (Carefree, Ariz., ranked for 6 years); Grand Cypress Golf Club North and South courses (Orlando, Fla., ranked for 4 years); Kauai Lagoons—Kiele Course (Kalapaki Beach, Hawaii, ranked for 2 years); Lost Tree Club (North Palm Beach, Fla., ranked for 3 years); The Loxahatchee Club (Jupiter, Fla., ranked for 2 years); Mayacama GC (Santa Rosa, Calif., ranked for 10 years); Mayacoo Lakes GC (West Palm Beach, Fla., ranked for 12 years); Scarlet Course at the Ohio State University (Columbus, Ohio, ranked for 3 years); Sherwood CC (Thousand Oaks, Calif., ranked for 4 years); Shoal Creek (Ala., ranked for 34 years); Sycamore Hills GC (Fort Wayne, Ind., ranked for 18 years); and Wynstone CC (North Barrington, Ill., ranked for 2 years). America’s 100 Greatest list is a story of the evolution of Golf Digest and the growth and change of its rankings through the years. In the 1960s, the late William H. Davis, a founder of Golf Digest, conceived the idea of a ranking of championship courses, basing it primarily upon USGA Course Ratings, the figure long used to determine each amateur’s handicap. The first ranking took three years to compile, was called “America’s 200 Toughest Courses,” and printed in Golf Digest’s October 1966 issue. In 1969, Davis assembled a national board of notable golfers to produce a tighter vision, America’s 100 Most Testing Courses. In 1971, the ranking was renamed America’s 100 Greatest Tests of Golf. In 1975, the board began meeting to debate factors beyond championship worthiness, and the list became America’s 100 Greatest Courses. A decade later, board members became panelists, who were required to play and evaluate courses using a series of architectural criteria, and their evaluation numbers produced the first numerical ranking of the Top 100. In the beginning there were 125 panelists; today there are 10 times as many. The same process is used today, although the categories have been redefined over the years. The magazine has also expanded the depth and breadth of its rankings, which have included everything from the “Best New,” to Reader’s Choice, Best Courses in 203 Countries, Best Golf Resorts, Most Fun Courses, and more.